Making the most of the Codgers temporary closure! Please note that this is an older post, and several significant and important changes have happened since it was written, please look for a more recent update on the site. The current forestry work in Codgers has closed more than half of the trails there. Although a temporary closure, many regular riders in Nelson are at a loss as to what to ride at the moment. This is particularly the case for Grade 3 riders who were most comfortable regularly riding Firball and Hulk ‘n’ Hogan. Visitors to Nelson are similarly affected as those two trails were the most common “Introductory” rides for visitors to the area. Updated 26-10-17: Lots going on in Codgers. The new Grade 2 trail “Tu-Meke” that runs below the Dun Mountain Trail and above Gully is now open and running mint, lots of fun little jumps and bumps and really easy to lap out, fantastic for kids and adults alike. You can check it out HERE. Crazy Horse is open again, as is Hulk ‘n; Hogan and IV Line (although the later is quite overgrown). Trail builders have started on modifications to Jack’s Track to make it a bit less steep on the way up, its not clear how long it will take to finish, and in the meantime people exiting Hulk ‘n’ Hogan will have to keep an eye out for possible track modifications or equipment, or possible temporary trail closures. News has it that Easy Trail Solutions is also about to start on the rejig of P51, we wish him good luck and god speed on that work. Keep your eyes peeled here for further updates. 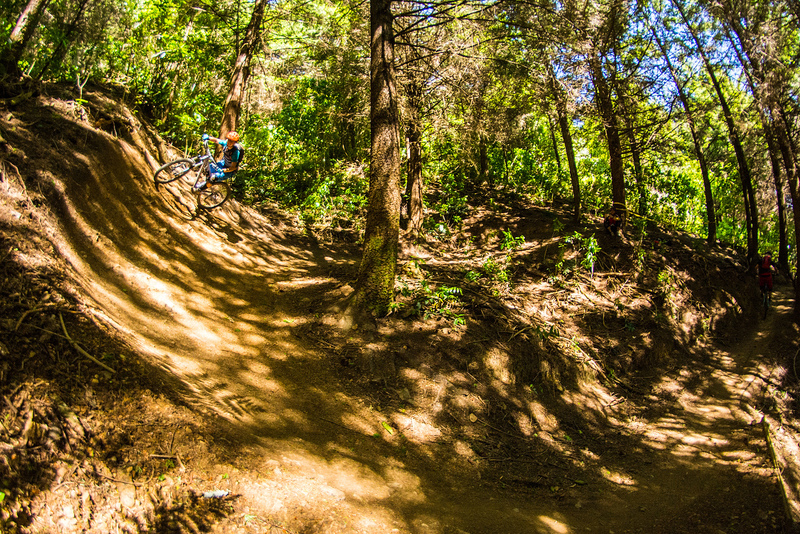 The good news is that there is still plenty to ride in Nelson, however riders are going to have to branch out from the “tried and true” and tackle some new trails and riding areas. Riders who are nervous about this should pop in and see us and we can talk through the trails most likely to suit their current skills or interests, or to discuss coaching sessions to build your skills up to tackling new rides, or even guided “orientation rides” to explore these new trails. Sharlands Wiggles/Waggles: Either riding from town for a nice 4km warm up, or driving and then parking at the entrance to Sharlands (or in front of the golf club) you can head up the Sharlands Road forestry road to the top skid site and find the entrance to the Wiggles/Waggles trails. These have recently been given a fluff by the “Trail Saints”, but are not completely overhauled. The ride up is not too steep, steady, and long. The trail back has a wide variety of features (like small bridges) and some rooty sections, but overall is not exposed, steep or scary. Many sections are on a par with Firball in terms of difficulty, but it may take a few runs to get used to carrying speed over the roots. Riders who don’t want to start at the top will notice that there are several entrances to this trail during the climb up Sharlands Road, so it is possible to sneak in earlier if you have less time or have run out of steam. You can check out more details on Trailforks: Here, HERE, and Here. Please make sure you have a club forestry access permit before entering this area. These can be obtained by joining the Nelson mountain bike club or purchasing a temporary permit from our shop. Silvan Forest: Only a 15 minute drive from the center of Nelson, and located at the end of Champion Road in Richmond this private forest has an extensive network of grade 3 trails with the odd lower grade 4 trail mixed in there (check them all out on TrailForks HERE). 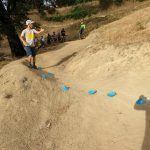 Riders who are comfortable with Firball will have no major problems with the trails here, although it may take a bit of practice (or coaching 😉 to get used to the tighter corners that these trails are famous for. Chris Milden runs excellent coaching clinics in Silvan Forest and is also one of the chief trail builders there. Silvain is particularly suited to family groups as there are many many loops of different sizes, and any of the uphills can usually be abandoned part way up if the kids are struggling, and a fun time had by all on the way down. If you enjoy riding in Silvain please consider donating to the Trails Trust so they can continue developing new trails. Kaiteriteri: Well worth the the very scenic one hour drive from Nelson. 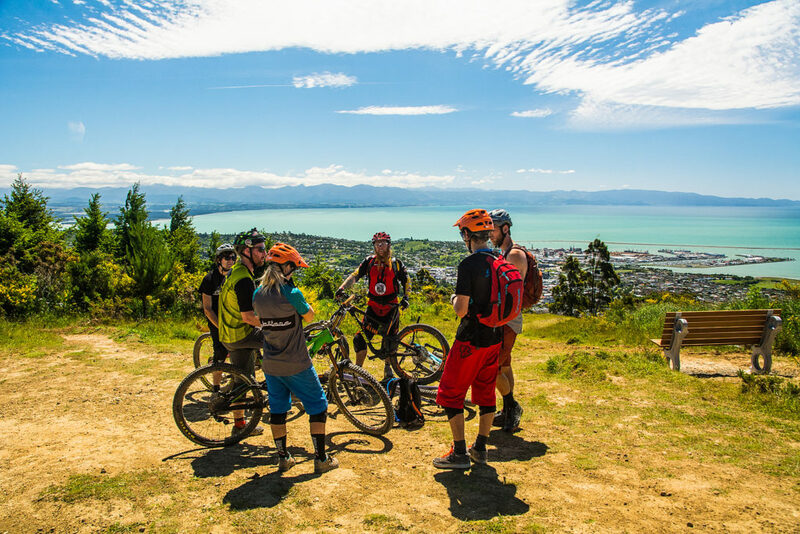 The Kaiteriteri mountain bike park network of trails has grown by leaps and bounds in recent years and now has an extensive network of trails of grades 2,3 and 4 (Check them out on TrailForks HERE.). Riders of all levels, and families in particular will love the great trails here, and the opportunity to chill out at the beach afterwards. While it is unlikely you would drive out there after work to ride, the trip is well worth it if you want a relaxing, fun, day of riding and a spot of relaxing afterwards. If you enjoy riding in Kaiteriteri please consider donating to their trails fund so they can continue developing new trails. Widdershins/Involution: These two trails are closer to Nelson (a 5 minute drive, or a 20 minute bike ride), located at the end of Marsden Valley road, the riding here is however a step harder than Firball. The uphill is steeper and longer than the climb to Firball trig, and the downhill is more challenging. However, riders who have handled Firball, Hulk n Hogan, Turners, Silvain and Wiggles/Waggles should at least give these trails a try. Again, the corners are tighter and more challenging than Firball, but with practice, patience, and perhaps a session or two of coaching they are totally doable. The downhill is chunkier and rougher than the trails in Codgers, but is not inherently dangerous, and there are no scary crux moves that need to be walked around. Both the uphill and downhill provide a real sense of accomplishment when conquered. Check out more details on these trails on TrailForks HERE. Rameka: The Rameka track (check it out on TrailForks HERE) and the work being done by Project Rameka are justifiably famous, and well worth a look, however, because the ride finished far from the starting car park you will need to plan how to shuttle yourselves or your vehicle. For the former, Gravity Nelson can arrange shuttles with Helibike Nelson, for the later we can arrange car relocation by LewCanDo. The top part of the trail is not particularly technical consisting mostly of a mellow traverse through beautiful native bush with some small stream crossings and rooty sections that might require pushing the bike. After the traverse the trail heads downhill to Takaka, through fun single-track. Less experienced riders may need to take some sections more slowly, but the whole trail should be ride-able by those confident with Firball. Further down there is one trail choice, those with less experienced should take the right hand trail, while more advanced riders can head to the left. Still further down and next to the river there are a number of intertwined trail options, some of which can be quite challenging, less experienced riders are encouraged to take the road through this section. 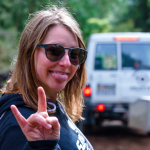 Once you re-unite with your vehicle you can head into Takaka for a late lunch before driving back to Nelson, or sneaking in a quick shuttle of Kaiteriteri. If you enjoy riding the Rameka please consider donating to the Rameka Project so they can continue developing new trails. Turners/Top Dog: While the easier tracks in Codgers are closed, Turners/Top Dog/Hot Box are still open (click the links to check them out). Many intermediate riders may have tried these trails once or twice, and perhaps found them over their head, but now is the perfect time to master them. Perhaps leave Hot Box for later, but there is no reason not to venture out onto Turners and Top Dog and scout them out, figure out the challenging parts and then session them with friends or a coach. Access during the logging operation will be from the Maitai side up Golf Course road (somewhat confusingly shown on TrailForks as the “Fireball-Maitai Walkway link”), please don’t try and enter from the Firball side. Please make sure you have a club forestry access permit before entering this area. These can be obtained by joining the Nelson mountain bike club or purchasing a temporary permit from our shop. Dun Mountain Loop: This remains open, so its business as usual here, full trail details on TrailForks HERE. Lower Crazy Horse and Firball Extention (below the Dun Mountain Trail): These trails are still open and perfect for groms to lap out with minimal supervision. Wairoa Gorge Bike Park: Don’t fear it, embrace it! While many of the trails are very difficult there are a handful of Grade 3 and low Grade 4 trails to be explored (The TrailForks filter function can be used to see some of them HERE, although other trails like Bermed As and Quattro can also be ridden by riders confident enough to enjoy Top Dog or trails like People’s Choice in Silvan). Most Intermediate riders can build themselves up to tackling these super fun trails. As you can see, despite the closure there is plenty of fun riding to do in and around Nelson, and the closure may actually be the best opportunity for you to broaden your horizons and explore new trails! Plus of course, we hope that Codgers will come back bigger, better and funner than ever before once the logging is finished.